Back again and I hope that this time is for good. I have been busy I must say. That's why this blog been neglected and I didn't have time to even do marketing for my e-bizz site. I thank my past customer, Ms. Z that had emailed me asking for my new site as my previous site was attacked by cyber-virus. I think I owe this much to her. Thanks for your support, Ms. Z. I'll keep a nice trinket for you after this. xoxo. Anyway, I have decided to just open BlogShop as opposed to dedicated e-commerce website and own hosting as I am not IT-smart. However, I assure you that the product would be the same as well as the service. I still believe in batik kaftans as I wore them almost everyday at home. 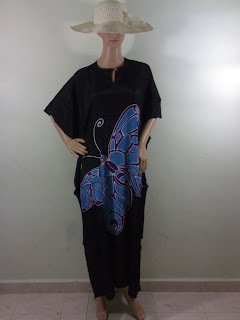 I aim to share the joy of kaftans not only for Malaysian users but also around the globe. I know my customers in Canada and the USA had enjoyed them.